(partial) Theory and application of adaptive control, H Unbehauen. Control of complex industrial processes - a survey, A Eli Nisenfeld. Control of energy and power systems, E Welfonder. State space approach to linear computer control, V Strejc. Basics, fundamentals and possibilities for digital control, H B Verbruggen. Microcomputer control of a printing ink plant, A Czulek et al. Design of advanced digital control algorithms for water turbines, P Kopacek. Various design aspects of microcomputer applications in power engineering, R Weber. Rule based supervising of power plants by colour display monitors, M Harrer et al. Comparison of digital control algorithms for industrial robots, P Kopacek et al. On-line computer control of transportation systems, F Ley & H Unbehauen. 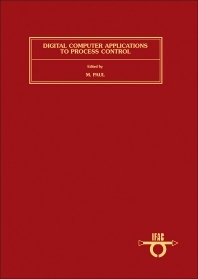 Considers the application of modern control engineering on digital computers with a view to improving productivity and product quality, easing supervision of industrial processes and reducing energy consumption and pollution. The topics covered may be divided into two main subject areas: (1) applications of digital control - in the chemical and oil industries, in water turbines, energy and power systems, robotics and manufacturing, cement, metallurgical processes, traffic control, heating and cooling; (2) systems theoretical aspects of digital control - adaptive systems, control aspects, multivariable systems, optimization and reliability, modelling and identification, real-time software and languages, distributed systems and data networks. Contains 84 papers. Of particular interest to systems analysts and computer scientists, control engineers, electrical and electronic engineers, industrial engineers and operational research scientists.